Starting off 2012 with a bang. It's only January and I've chalked up one author reading. 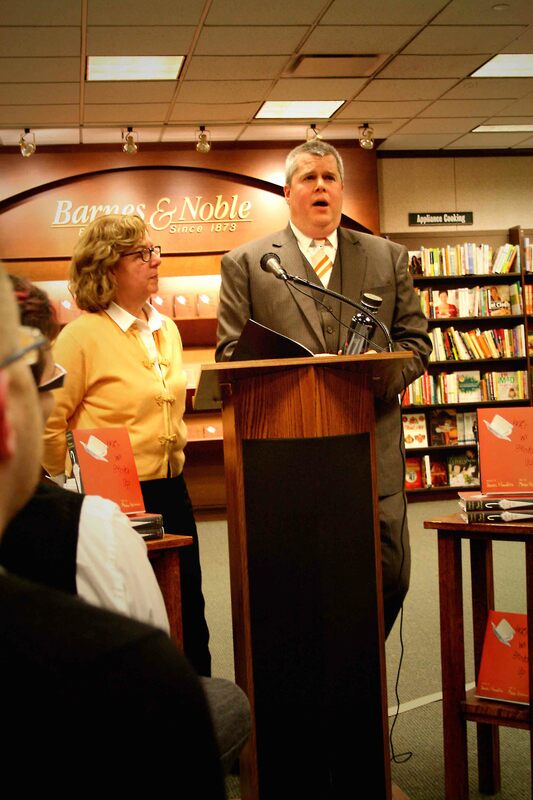 Daniel Handler and his illustrator Maira Kalman spoke at the Barnes & Noble in Skokie, IL this past Wednesday evening, the two of them playing off each other like a comedy act. Reader, I have seen nothing like it and the two of them had me laughing so hard I was in tears. The two of them together were like watching a Monty Python skit, American style, complete with a PowerPoint presentation featuring a woman on a fainting couch, a picture of a lost umbrella, a napkin with four grease stains – from onion rings, of course – and more. They've collaborated for a number of works and obviously have a wonderful working relationship. He lives in San Francisco and she in New York but they met in Bologna, Italy at a children's literature festival. The two hit it off immediately and thank goodness for that. They've created so much together but you'll have to look that up yourselves, sorry. This was the first author reading my daughter's attended, because it's the first author she actually recognized and whose books she's read. I don't think she read all the Lemony Snicket Series of Unfortunate Events books but she read quite a lot (as did I) and saw the film with a few friends, as one of her birthday parties. One at which I came close to having a nervous breakdown – quite literally. I was already emotionally stressed from the recent devastating loss of a close friend and then had these girls running around like idiots, nearly reducing me to tears. 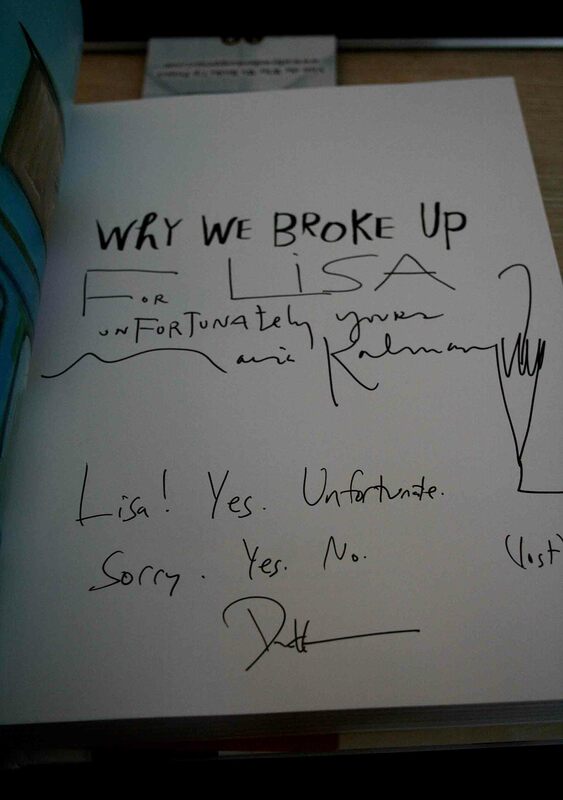 It's a wonder I wanted to see Daniel Handler after that but years pass and yadda yadda. She was incredibly intimidated approaching an author for the actual signing, hiding behind me as long as she could before I made her put her own book on the table. She was afraid he'd talk to her, you see, and expect her to answer. I tried convincing her authors are, for the most part, normal human beings who eat food, smell badly if they don't shower and have to breathe now and then to stay alive but she'd have none of that. 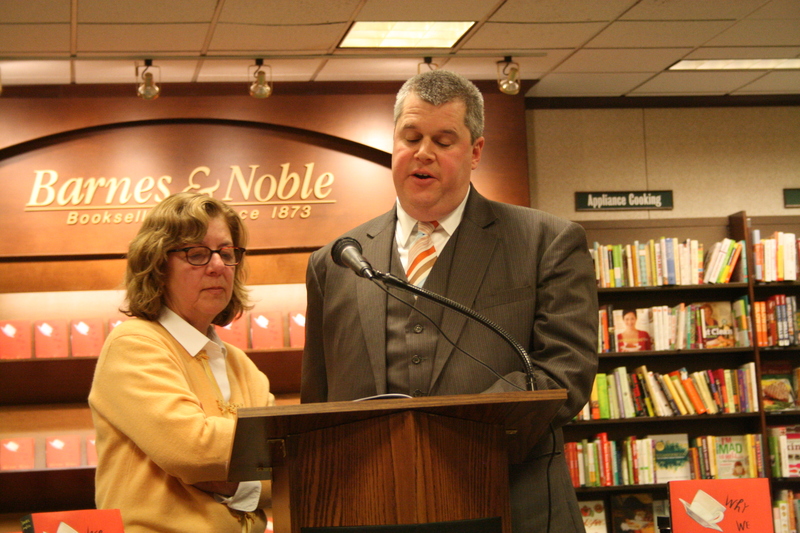 "BUT IT'S LEMONY SNICKET!" she said. As it turned out all he said was, "Is this your book?" signed it, and she thanked him. He was already on to the next in line before she'd even stepped away. Daniel and Maira were promoting their latest collaboration, Why We Broke Up. It's ostensibly a YA novel, though the two said they don't distinguish YA from adult. The audience was made up mostly of adults, so I kind of see their point. But then there were a few teens clasping copies of Lemony Snicket, as well as some with other books Kalman has illustrated. What I found utterly fascinating was how they produced the book when they live on opposite coasts. Yes, I'm aware there's this thing called the internet, but their description of the process enthralled me. Sometimes she'd send him a picture she'd drawn and he'd write around that. Other times it would be the reverse, he'd write something and ask for a specific drawing. 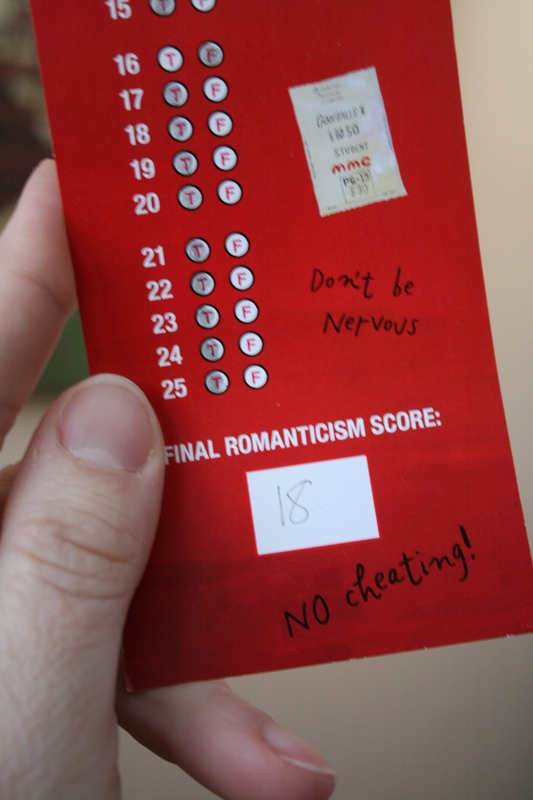 Part of the reading involved taking a "How Romantic Are You?" quiz, another first in my author event experiences. The higher the number (1 – 25) the more romantic you are. And I scored 18! Me, 18! I would protest but this was obviously a scientific test. Meanwhile, my daughter scored something in the range of 8 or 9. I've lived long enough to become jaded and sour and she's just 18. For some things I have no explanation. 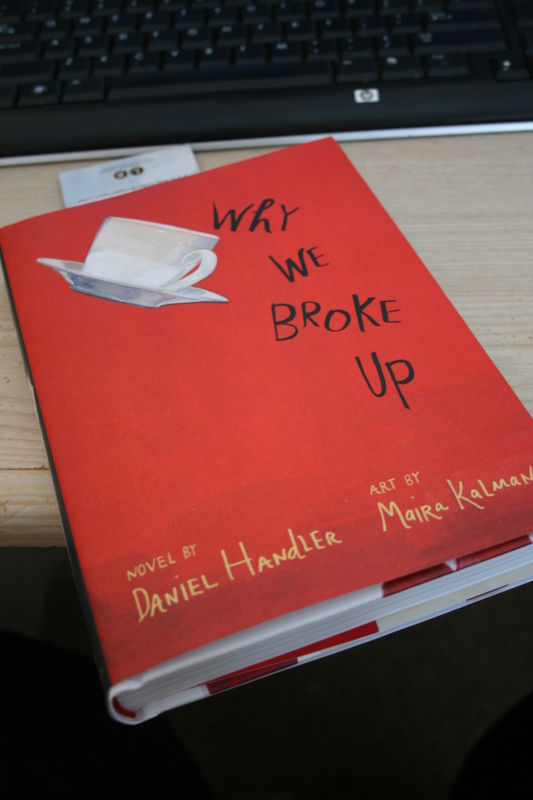 Daniel Handler and Maira Kalman you are lovely. Thank you for the most silly author event I've yet attended, the red plastic combs we received as a bonus gift and for getting my daughter past her fear of actual writers. Thanks also for educating me as to my true romantic nature, of which I've been ignorant. And please remind me to advise my daughter's husband (when she's 35 and I allow her to marry) of her distinct lack of same. I’m totally pea green with envy. I love the sounds of this. I haven’t read Kalman yet, but the more I read/hear of her, the more I want to! So cute that your daughter was intimidated. I think I might’ve been, too! Okay, I totally love that video (did Eric ever show? 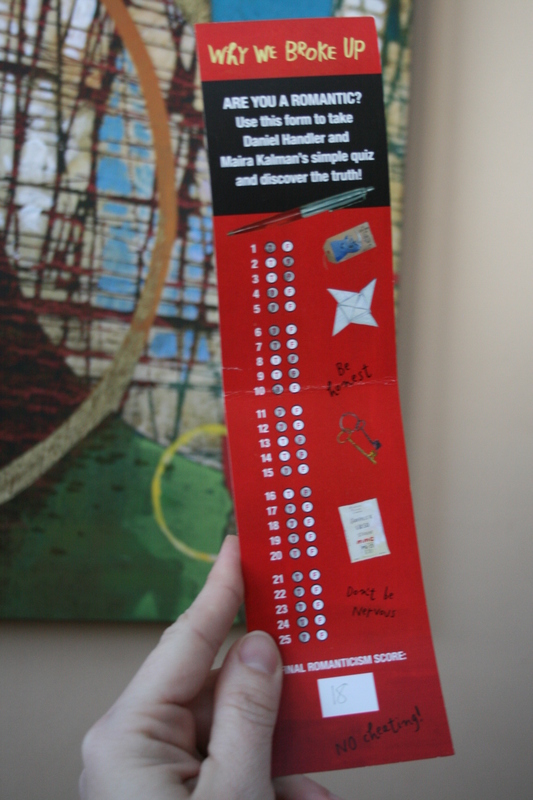 ), and want to read that book now. I’ve read several of the Lemony Snickets, and especially adore the audio-books narrated by Tim Curry — although the ones read by Daniel Handler himself are pretty nifty too. Les, the only author that’s really intimidated me was Michael Cunningham when he spoke at the Illinois Library Association dinner last October. I got to chat with him one on one and was so nervous beforehand! He’s so sweet, though. So nice and personable. I’d interviewed him prior to the event. Though he was so busy he gave me time and didn’t rush it at all. A class act, that one.